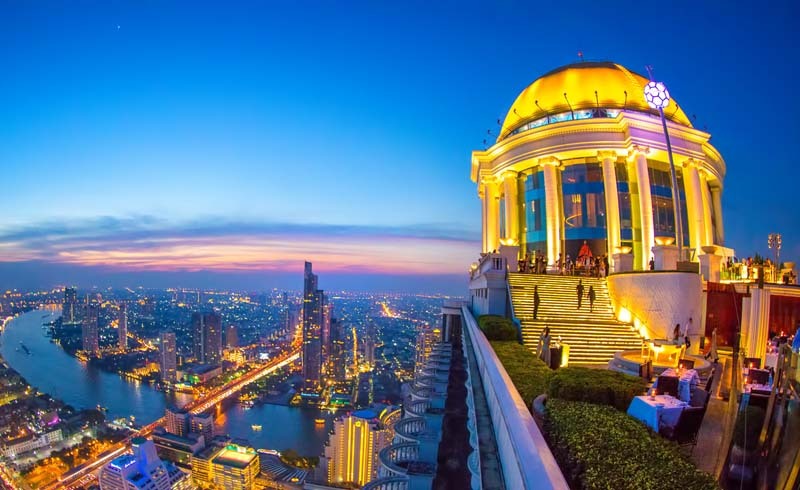 Many of the best places to visit near Bangkok are within 4-5 hours of the city. Although technically you could get there and back with an early start, you’ll probably want to slow down and enjoy them by spending a night or two. Bangkok certainly has its gritty charm. After all, it was the most visited city in the world in several different years, surpassing New York and London. It’s always in the top 10. But beyond enjoying some obligatory post-trip shopping, rampant heat, traffic, and pollution aren’t exactly an ideal end to a relaxing vacation. Fortunately, there are plenty of good opportunities for day trips near Bangkok. Ayutthaya and Kanchanaburi, two highly historic options, are within an easy striking distance of Bangkok. If you’re craving sand and sunsets before heading home, a number of islands tempt; charm increases with the amount of time invested to get to each. The easiest, nearest option on this list of Bangkok day trips definitely doesn’t require an overnight stay. The Ancient City (also commonly called “Ancient Siam”) is just about an hour away. If you only have an afternoon to spare and want to get away from Bangkok’s concrete embrace, head an hour south for a pleasant escape. Wandering the beautifully manicured 200 acres of the Ancient City provides a microcosm of Thai culture and history. The atmosphere is romantic. Famous archaeological sites — some of which are difficult to reach or no longer standing — have been tastefully recreated. 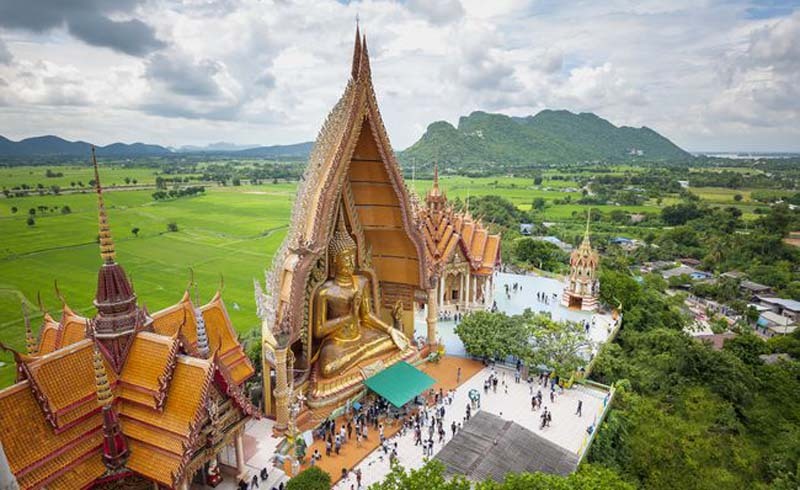 Photogenic monuments, temple replicas, Buddha statues, and gardens provide a peaceful respite from the city along with a chance to learn a bit about Thailand. In fact, the entire park is actually shaped like Thailand. The grounds are expansive! If the walking is too much, bicycles and golf carts can be rented; guided tram tours are available. The relatively steep entrance fee of 700 baht (plus 400 baht per vehicle) is cut in half at 4 p.m. The Ancient City closes at 7 p.m. Tip: If you've still got time to spare in Samut Prakan, the Erawan Museum is another interesting attraction in the vicinity. Getting There: Bypass some of Bangkok’s perpetual traffic jam along Sukhumvit by taking the Skytrain all the way to On Nut station. Try not to laugh about the name, then switch to a taxi or Uber. 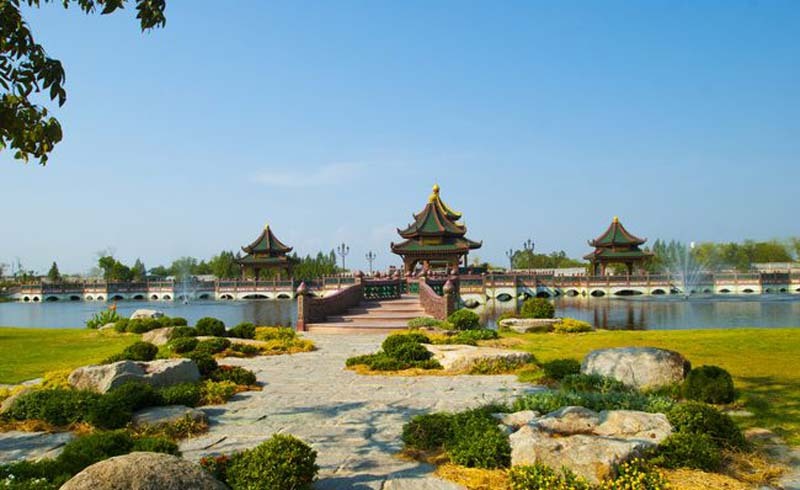 Tell the driver you want to visit the Ancient City (Muang Boran). 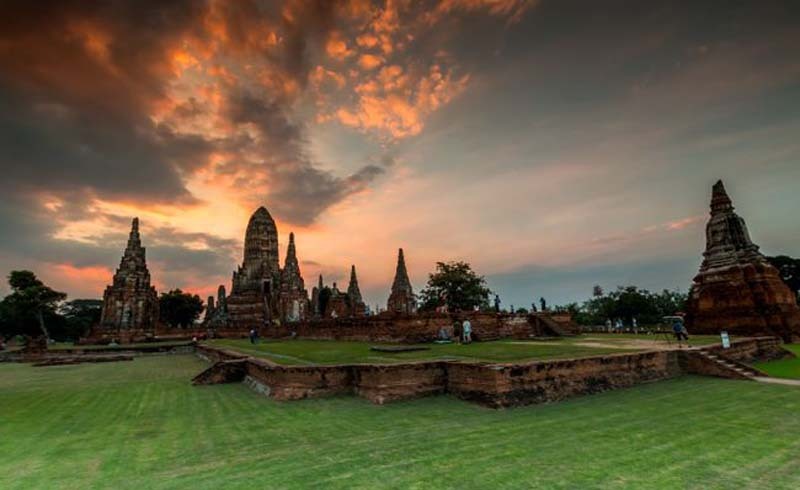 Although Ayutthaya — the ancient capital of Siam from 1350 to 1767 — is often visited as a day trip from Bangkok, an optional overnight stay will provide proper time to enjoy. On a day trip, you’ll be rushed trying to see so many ruins in a single afternoon and ultimately miss the ancient vibe that permeates the place. The reason you aren't reading "Best Places to Visit Near Ayutthaya" is because the Burmese sacked the ancient capital in 1767, causing it to be moved downriver to where Bangkok stands today. The crumbling temples and headless Buddha statues of Ayutthaya (properly pronounced “ai-yoot-tai-yah”) are best enjoyed in much the same way as Angkor Wat in Cambodia: by renting a bicycle. Getting There: The best way to get to Ayutthaya is by train. You’ll glide past much of Bangkok’s traffic while enjoying some authentic scenery. Depending on which train service you choose, the journey takes around two hours. You can purchase a ticket yourself for one of the many daily trains at the Hualamphong Railway Station. But arriving in Kanchanaburi doesn’t feel much more peaceful — at least until you get out of the busy part of the city and choose one of the many guesthouses with pleasant gardens stretched along the river. The French novel The Bridge Over the River Kwai was set in Kanchanaburi. The bridge, and most of the story in the film, were highly fictionalized. Technically, the bridge in the movie should have been "The Bridge Over the River Mae Klong." And River Kwai should be "Khwae Yai." Regardless, the impressive bridge in Kanchanaburi was one of many that were part of the infamous "Death Railway" constructed and repaired by forced POW labor. The infamous "Hellfire Pass" is nearby. World War II history abounds in the area. Visit the museum and one of the war cemeteries to learn the real story. Getting There: Kanchanaburi can be reached from Bangkok via bus or train; however, buses and minibusses are the most popular options because trains depart from Thonburi Station, across the Chao Phraya River in the northwest part of Bangkok. The two daily trains take around three hours to reach Kanchanaburi. Getting there by bus may take anywhere from 2-5 hours, depending on traffic and tenacity of your driver. 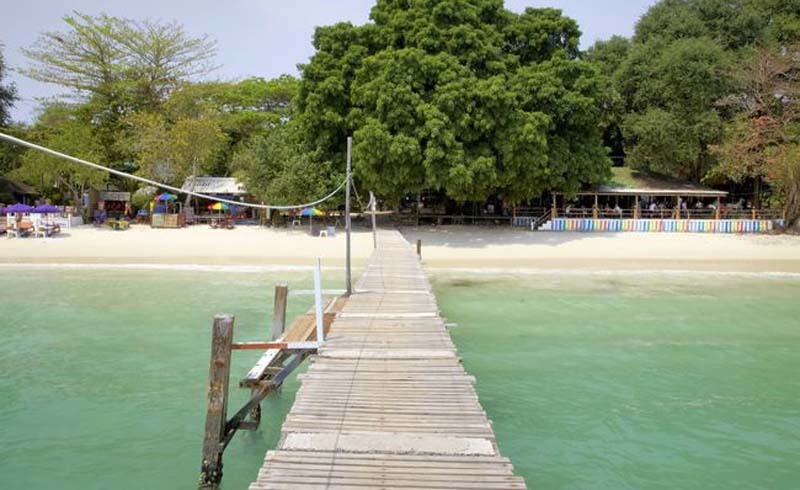 At around 4.5 hours from Bangkok, Koh Samet is just slightly out of “day trip” range, but that doesn’t stop it from attracting a lot of travelers who would rather spend their last day or two in Thailand on a beach. 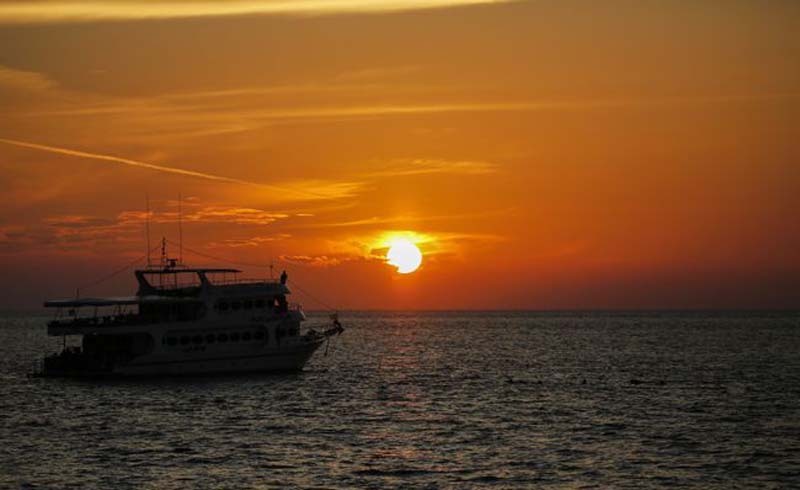 Although Koh Samet has all the usual ingredients of a Thai island (nice beaches, fire shows, and bucket drinks), it somehow misses the chill vibe that permeates Koh Lanta, Koh Tao, and other islands. Regardless, if you’re short on days before flying out of Bangkok, Koh Samet is an excellent choice for cleaner air and a fire-show cocktail. Getting There: The easiest way to get to Koh Samet is to purchase a bus-boat combo ticket, on offer from every travel agent in Bangkok. If you still want to make your own way, get help finding one of the minivans that depart frequently from Victory Monument; they run directly to the ferry pier. Once at the pier, you can purchase your own boat ticket for the short hop to the island. Beware: there isn’t much room for luggage in the local minivans. Getting There: Getting to Koh Si Chang requires passing through Sri Racha in Chonburi Province — the namesake of the highly celebrated hot sauce. The trip takes around three hours, including an hour on the ferry. Often transliterated as “Koh Larn,” Koh Laan (Coral Island) is Koh Si Chang’s little island neighbor to the south. Koh Laan is slightly closer to Pattaya and offers better beaches and sand than those found on the mainland or Koh Si Chang. The island isn’t exactly undeveloped (yes, there is a 7-Eleven), however, the atmosphere is relaxed. 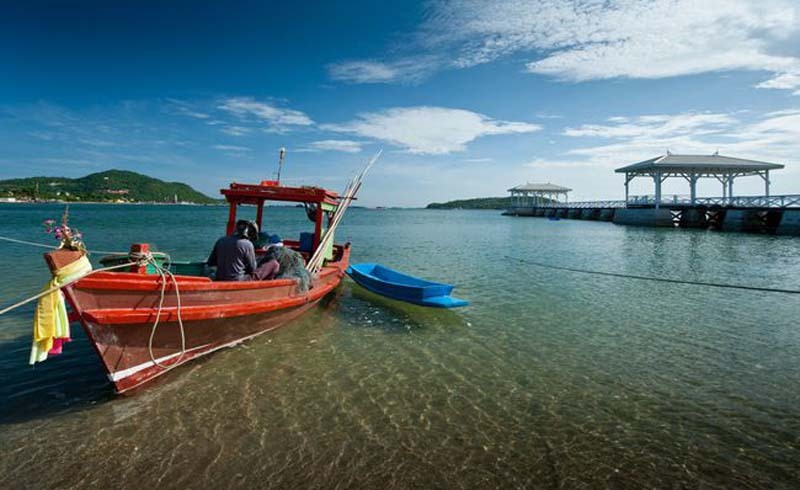 Koh Laan ends up being a quick jaunt for travelers and locals in Pattaya who go over for swimming and seafood. There isn’t much to do on Koh Laan aside from sunbathing, snorkeling, and swimming — but that’s the point! Tip: Plastic waste is a serious problem on Koh Laan. Do your part by refilling bottles and taking them back to the mainland to dispose of. Getting There: Ferries from Pattaya take around an hour, or you can cut travel time in half and have more fun by upgrading to a longtail speedboat. Watch out for the resident monkeys on the island; they’ve been known to rob bags left on the beach. Koh Chang (Elephant Island), is the second largest island in Thailand — Phuket is the only one larger — and it’s definitely the nicest island escape near Bangkok. Unlike Koh Samet and Koh Si Chang, the island is big enough to accommodate both extremes: finding a nightclub party or escaping into bamboo-hut tranquility. Koh Chang has mutated from the “backpacker paradise” as it was once known. Close proximity to Bangkok accelerated high-end development in the last decade. But White Sand Beach still lives up to its name, despite beach buffets fighting for room on the powdery sand. Fortunately, smaller beaches can be found around the island where reggae bars and hammocks are still the ​norms. Getting There: Again, the easiest and most economical choice is to let a travel agent book a bus-boat combo ticket to the island. 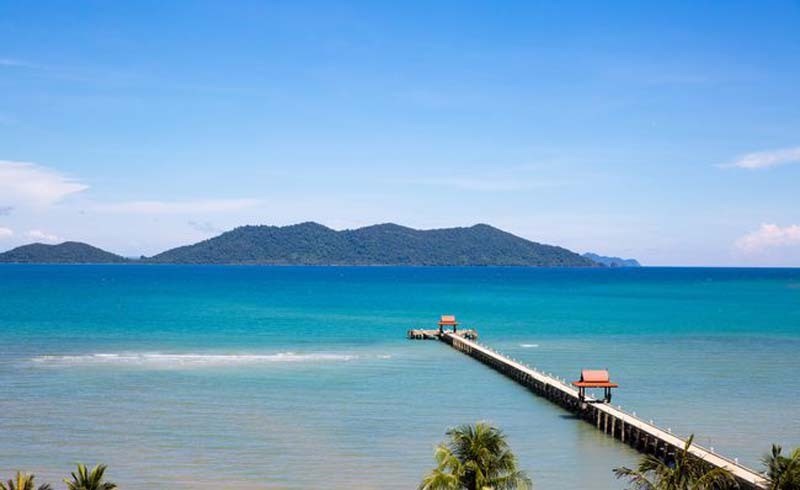 But if spending five hours on a bus sounds miserable, you can take a one-hour Bangkok Airways flight to Trat Airport (airport code: TDX) then get your own ferry to the island. Although Thailand doesn’t have much of a wine legacy, the unique “floating vineyards” situated 40 miles south of Bangkok in Samut Sakhon provide an interesting day trip from the city. Fresh fruit from Thailand is often sweet and way tastier than average, so there is some potential to produce good products. The local “Spy” brand of wine coolers are a popular drink to balance the heat of the afternoon and the spiciness of the food. 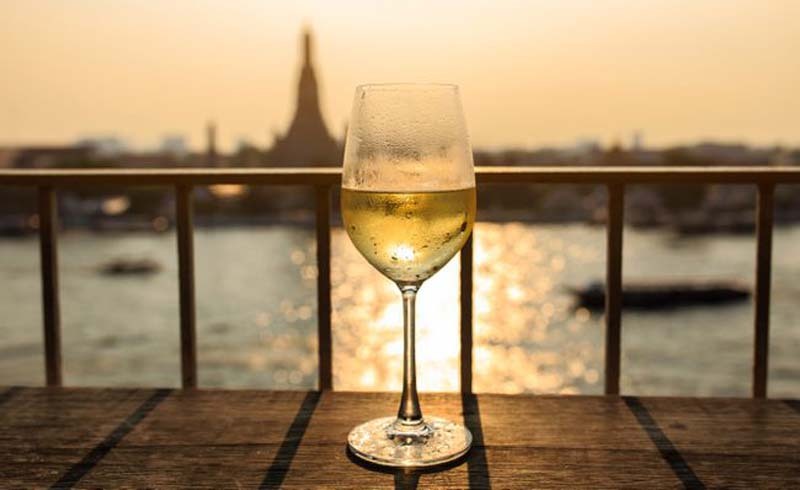 The floating vineyards don’t really float, but they are built on rich land reclaimed annually from the Chao Phraya River delta. Workers push small boats between the narrow rows to do their pruning. Visitors can take a tour ​and sample products, however, the operation is oriented around actual production, not accommodating tourists. Facilities aren’t very accessible for disabled travelers. Getting There: Siam Winery is one of the largest and most popular vineyards to visit. 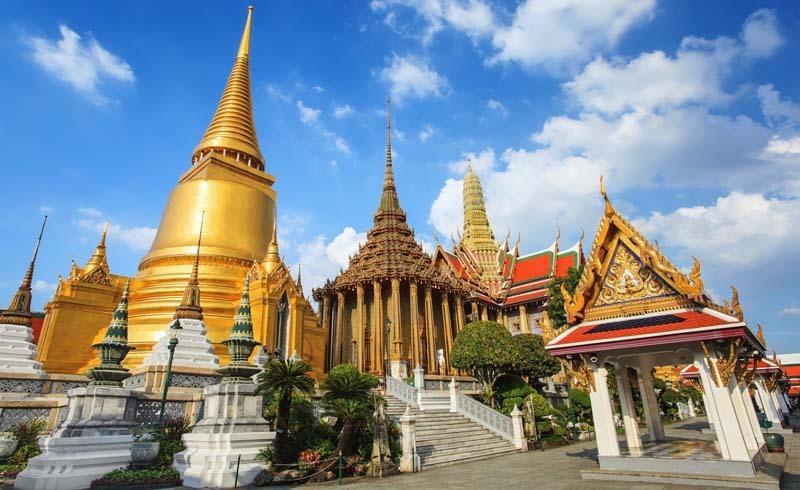 Read up on the available tours then contact a travel agent in Bangkok. You’ll definitely need a guide to have access. Tours run for approximately fours hours and are best enjoyed during Thailand’s dry season (November to April). Over three miles of beach provide room for everyone. Major hotel chains and restaurants occupy the main strip with numerous spas squeezed between. But to Hua Hin's credit, some greenery still remain on nearby hills. 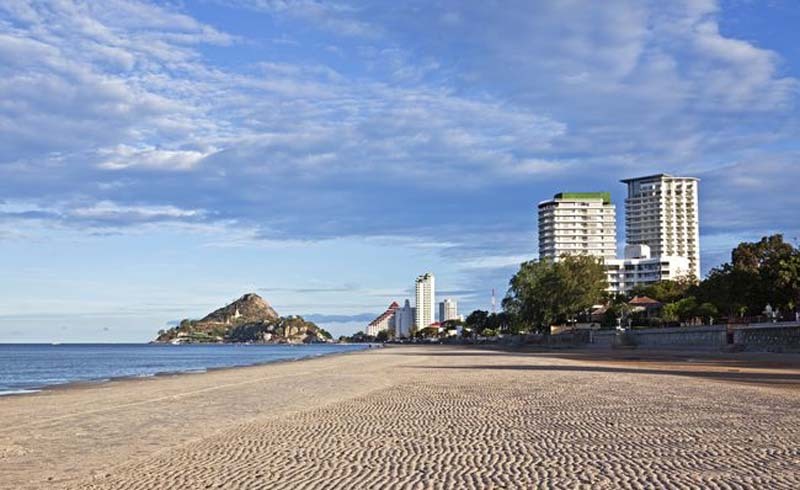 Khao Takiab (Chopsticks Hill) occupies the southern end of the beach and provides an excellent view of the full length of Hua Hin. The Buddha statues on top provide ambiance for taking in gorgeous sunsets — but beware of the many cheeky monkeys that consider the hill their own. Getting There: Although slower, train is the most enjoyable and convenient way to get from Bangkok to Hua Hin. Taking the train eliminates transfers and allows for more interesting scenery. Plus, the railway station is right in the center of Hua Hin, making for a very convenient arrival.